During the holidays there are so many parties and potlucks and it’s fun to make something that people remember. Charlene, an AT&T co-worker, shared this recipe several years ago after she brought this to one of our office potlucks. The first time I made it, I had the snowman standing upright. Big mistake, no one wanted to dip into it and have Mr. Snowman tumble. 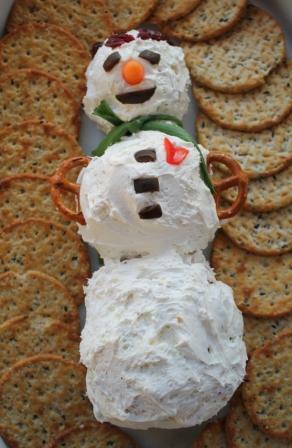 Give Mr. Snowman a rest on a platter and surround him with crackers. He’ll be a big hit! Mix cream cheese bars and chopped dried beef. Add chopped green onions (white part only). Blend in garlic, horseradish and parsley. Spread whipped cream cheese over snowman using wet knife. Garish and serve with crackers, carrots, pretzels. Spring brings wonderful strawberries to the markets. Honey goat cheese pairs beautifully with strawberries and with a hint of honey drizzle, you have a very simple, delicious appetizer (or dessert). Yummy! Wash, stem and halve strawberries. Allow them to dry on paper towels. Place a small piece of Honey Goat Cheese on top of strawberry and drizzle with honey. Quarterly book club review of the book, The Chile Queen by Sandra Dallas, was big hit. She has become one of my favorite authors. Our book review is always preceded by our favorite part of the evening, the themed potluck. This time the theme is Southwest and the main dish included four different versions of Chile with cornbread. What to make to compliment chile? I found this recipe from Paula Deen, which I altered to suit my taste, and loved the results. It has made me think there are even more creative ideas for for delicious deviled egg. I love my Mother’s old fashioned deviled eggs but I’ll be branching out to find other versions! Halve eggs lengthwise. Remove yolks and add to a small bowl. Mash the yolks with a fork and stir in the mayonnaise, cheese, salsa, sour cream, green onion, and cumin. Add salt and pepper, to taste, and blend well. Fill the egg whites evenly with yolk mixture and garnish with additional green onions, if desired. Arrange in a container and store, covered in the refrigerator, until ready to serve. Brie and Blackberries is like a slice of heaven. For my last meal, I would definitely choose Brie and a bowl of berries so this recipe sounded perfect to me! It’s relatively simple to make. Delicious addition to my recipe box! You’ll notice a glimpse of Fancy Schmancy Asparagus to the right as well. I used 1/2 of the crescent rolls to make the Blackberry Brie Bites and the other half for the Asparagus. Win, win! Separate the crescent rolls into 4 rectangles. Press the seams together and cut into 6 even squares. Press into 24 mini muffin tins. Cut the rind off the Brie. Cut into 24 small squares. Place on square into each crescent lined tins. Spoon a small amount of blackberry jelly/jam on top of each cheese square. Fold the tips of the crescent rolls over, if desired. Bake at 350 degrees for 12-15 minutes. Remove from the oven and top with a fresh blackberry on a toothpick. Serve immediately. This past weekend my older daughter, Megan, and I hosted a baby shower for younger daughter, Sarah, due April 27. Megan did all of the planning and the food was to be ‘baby size’. One of the recipes that we chose was Mini Corn Dog Muffins. Served with mustard and ketchup they were a big hit for little ones and grown-ups alike. Let me warn you…they are addictive! Combine butter and sugar in a bowl and whisk to combine. Add eggs and whisk to incorporate. Add buttermilk and whisk again. In a separate bowl, combine baking soda, cornmeal, flour and salt. Stir to combine. Whisk into wet ingredients. Spray mini muffin tins with non-stick spray. Spoon 1 tablespoon of batter into each mini muffin cup. Place one hot dog bite into the middle of each cup. Bake for 8-12 minutes (oven temperatures may vary) or until cornbread is golden brown. Cool in mini muffin tin for 5 minutes before removing and serving. I found using a small bamboo skewer was the perfect way to loosen the edges of the muffins to remove from the muffin tin. Serve with sides of mustard and ketchup. Store leftovers in the refrigerator and re-heat for 20-30 seconds in the microwave before serving. For Snickerdoodle mini-cupcakes, see post Friday, March 22.